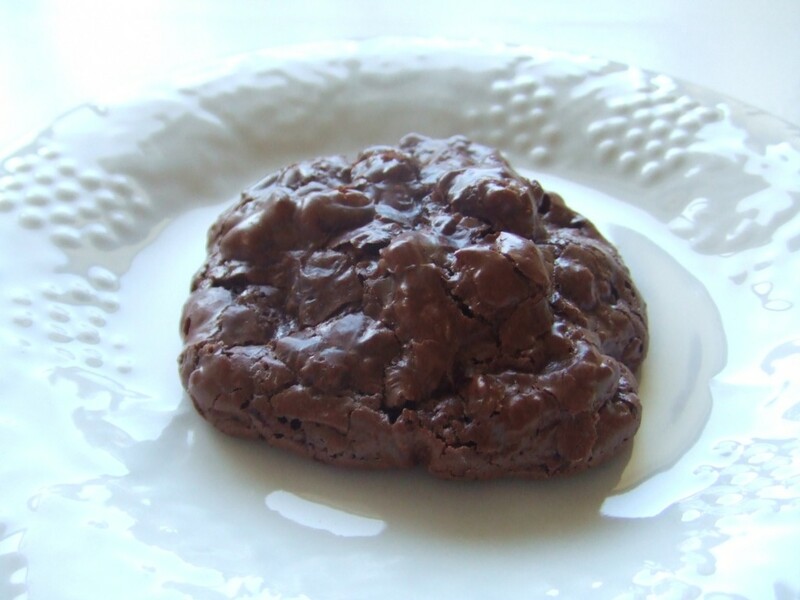 This is François Payard’s recipe for a flour-less, butter-less cookie that has a delicious fudgy interior and a beautiful shiny exterior. The dough is not going to look like typical cookie dough. 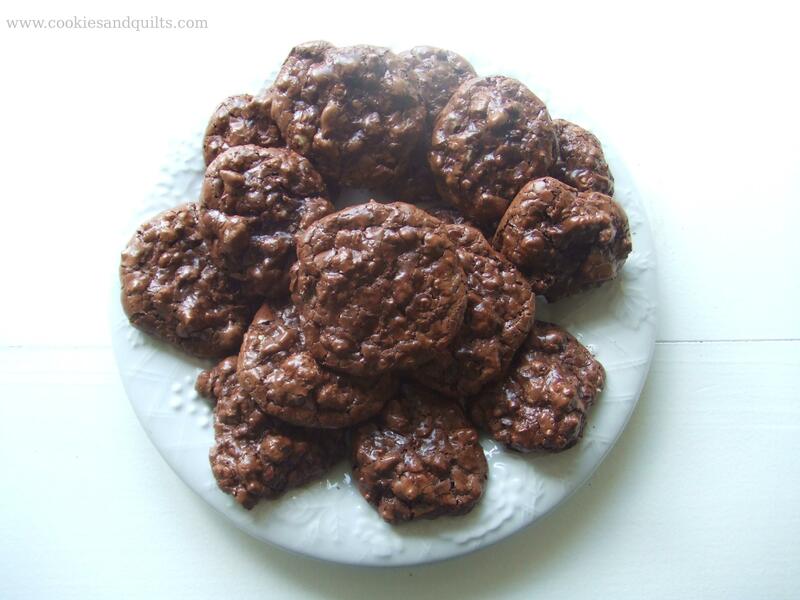 In fact, the first time my mother made this recipe, she thought the batter was such a sad prospect for cookies that she dumped it in a pan and baked it like brownies instead… and those tasted great, too! 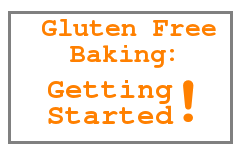 Ingredient note: If you are making these gluten free, make sure to check the brand of walnuts that you buy. I have noticed a few brands, and specifically Diamond brand, have a warning on the back that their product is made in a factory with wheat products. Preheat oven to 350ºF. Toast the walnuts on a foil or parchment lined baking sheet until they are golden and nutty smelling, about 7 – 10 minutes. Let cool, and then chop. I like to roughly chop about half of the nuts, and chop the rest more finely. Line a baking sheet with parchment paper. 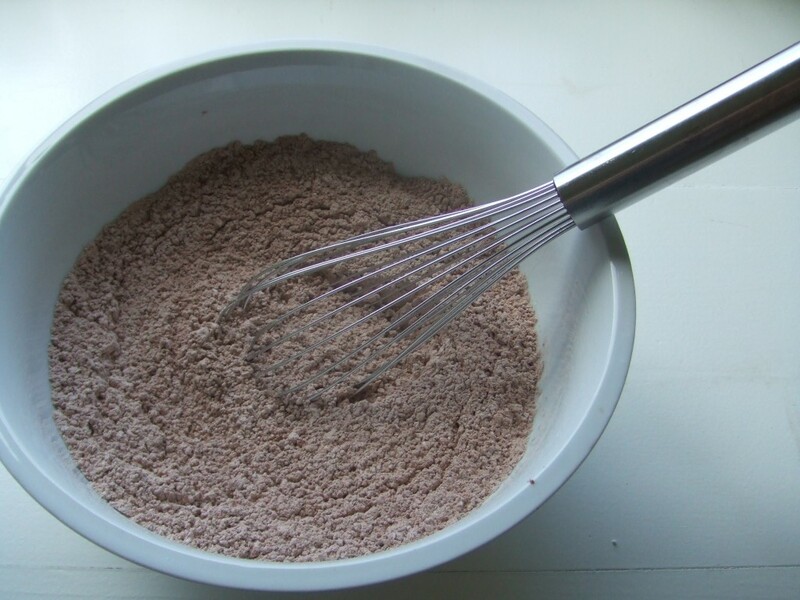 In a large bowl, whisk together the powdered sugar, cocoa powder, and salt. Powdered sugar, cocoa, and salt. Add the cooled walnuts and mini chocolate chips to the sugar mixture. Add the egg whites and vanilla and start stirring with rubber spatula to combine. 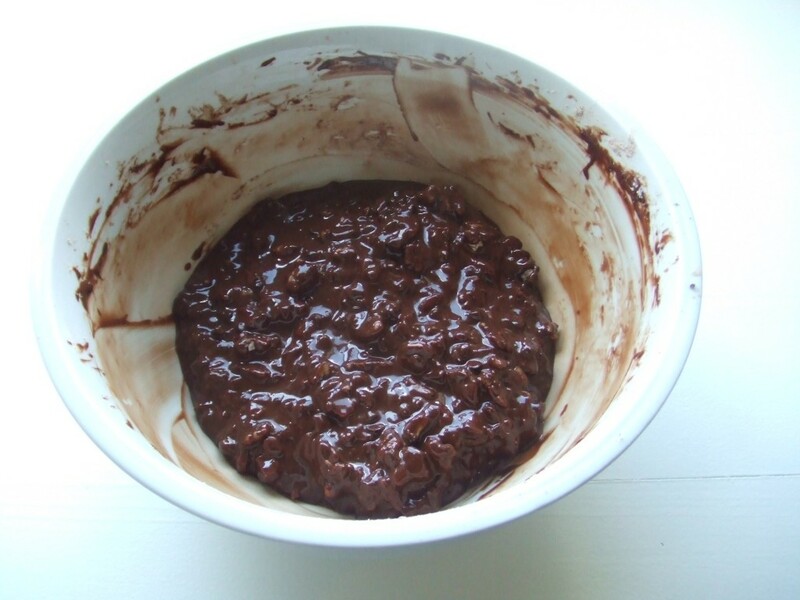 You want to do this by hand, not with an electric mixer, and you do not want to over-mix the batter. It may start to feel stiff when it is about halfway mixed. I like to stop mixing it at this point and let it relax for a few minutes. Halfway mixed batter.... it's ready to rest for a few minutes. It will be easy to finish mixing the batter after it has had a little vacation! The batter will appear runny and shiny. Drop with a portion scoop or spoons onto the parchment lined cookie sheet. If there is a large pile of walnuts sticking up in the middle of a cookie, push them down with the back of a spoon so the raw cookie is not more than an inch tall. Bake time should be 12 to 15 minutes, depending on the size of the cookies. They are done when the tops of the cookies are shiny and crackly. Allow the cookies to cool for at least 10 minutes on the parchment sheet. They should pull off the parchment easily and leave only a small amount of cookie residue behind. Sample one of the cookies- they should have a fudgy interior. If they seem a little dry, reduce the cooking time on your next sheet of cookies. If they are completely cool, but are difficult to get off of the parchment paper without a mess, increase the cooking time. Preheat oven to 350ºF. 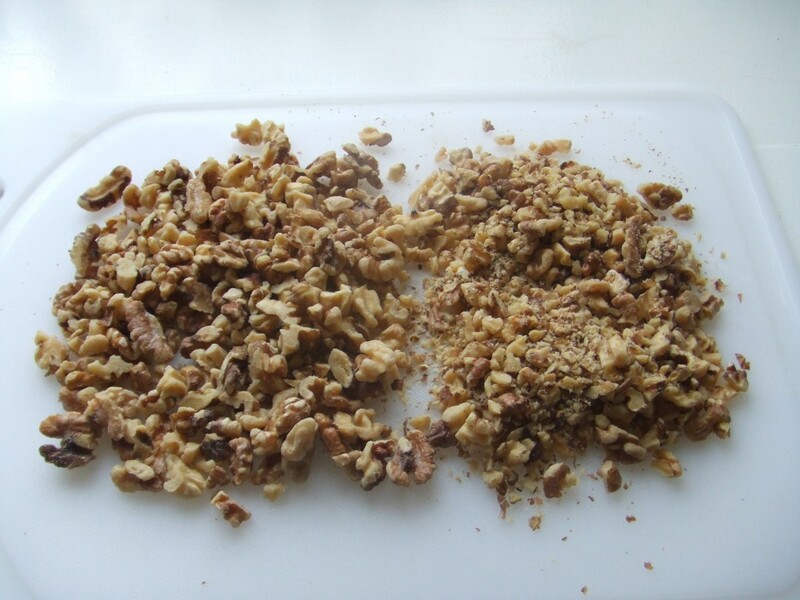 Toast the walnuts on a foil or parchment lined baking sheet until they are golden and nutty smelling, about 7 – 10 minutes. Let cool, and then chop. Line a baking sheet with parchment paper. 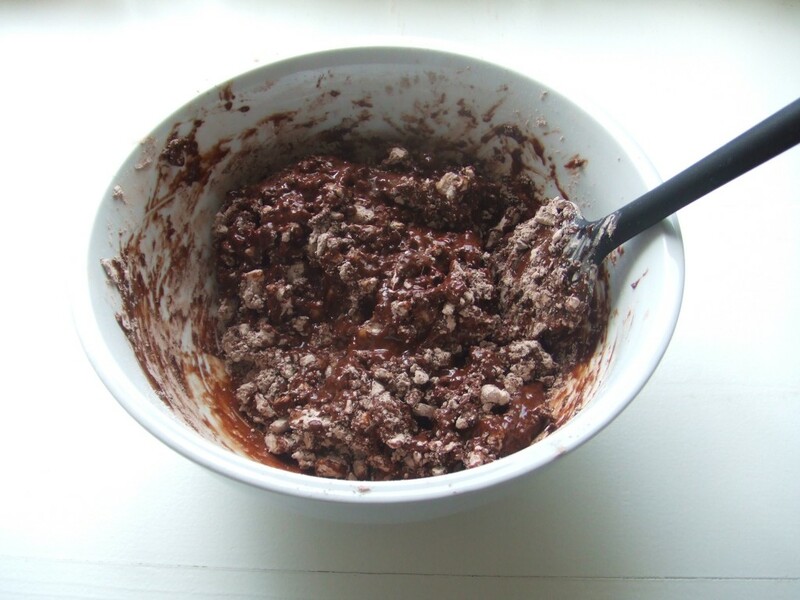 In a large bowl, whisk together the powdered sugar, cocoa powder, and salt. Add the cooled walnuts and mini chocolate chips to the sugar mixture. Add the egg whites and vanilla and start stirring with rubber spatula to combine. Do not over-mix the batter. It may start to feel stiff when it is about halfway mixed – stop mixing it at this point and let it relax for a few minutes.